Madagascar, the fourth largest island in the world, is also one of the world's poorest countries. 80% of the population lives in rural areas with difficult access to most services. In Madagascar, as in many other countries, the remote communities living in poverty are the most vulnerable segment of society. The availability of health services is extremely limited, leading to high rates of infant, child, and maternal mortality. 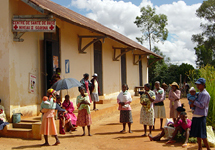 The USAID-funded Madagascar Community-Based Integrated Health Project (CBIHP), known locally as MAHEFA, was a five-year health program that provided basic, quality health care to isolated populations in six north and northwestern regions of Madagascar (DIANA, SAVA, Sofia, Menabe, Boeny and Melaky). 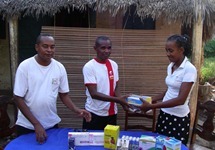 The program’s overarching goal was to increase the use of proven, community-based interventions and essential products among underserved populations of Madagascar. Activities focused on improving access to and use of an integrated package of maternal, newborn, and child health services, family planning, and improving safe water, hygiene, and sanitation. 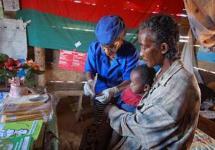 The program continues to be known for innovative solutions to reaching remote communities, documented improvements in community health, and collaborative work with local NGOs, the Malagasy Ministry of Health, civil society organizations, and community leaders. With the support of MAHEFA, community health workers provided a package of services, including counseling, referrals, treatment, and demand generation in maternal, newborn, and child health; family planning/reproductive health, including prevention of sexually-transmitted infections; water, hygiene, and sanitation; prevention and treatment of malaria; and Nutrition. 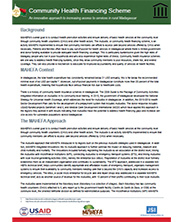 MAHEFA’s vision was for all communities in MAHEFA regions to effectively participate in improving health. The program trained and equipped 6,052 community health volunteers (CHVs) to provide selected health services and counseling, improving health for 3.5 million people in six remote regions of the country. MAHEFA supported community institutions to assist the community workers in building healthy behaviors and improving access to water, sanitation, and hygiene at home including construction of more than 86,000 latrines. 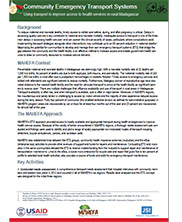 Some highlights of MAHEFA’s achievements include family planning provided to 204,600 regular family planning users, 47% of whom were between 15-24 years old; over 620,000 children under five were treated for malaria, diarrhea and pneumonia; and the percentage of pregnant women receiving assisted delivery increased from 50% to 78%. The progress in maternal, newborn and child health will be sustainable, built upon community participation and government support. JSI was the lead implementing organization and had two main implementing partners: The Manoff Group and Transaid. In addition, JSI worked with and through a network of talented partners including small and large NGOs, private sector groups, social marketing organizations, and community partners.